I visited the Apple website today, and for the first time ever, I did not feel an overwhelming urge to sell a body part to finance the acquisition of a Macbook Air. Granted, the device is quite a lust-worthy piece of tech gadgetry, but over the last few months, I have slowly lost the base lust that Apple has learnt to arouse in us. The reason? I spend on average for 14 to 18 hours in a day on a computer. I use a Macbook Pro at home and a 6 year old IBM T60 at the office. The reason I am able to switch so easily between the two OS is the fact that 95% of my work gets done on a browser. 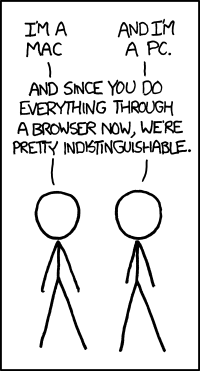 Chrome, to be precise. Between Google Apps, Dropbox, Google Drive and the fact that my entire business, pesatalk.com, is online, I have little use for anything else on a computer. I do my calculations on the omnibar and listen to music off Mixcrate. This reliance on the browser means that going forward, I don’t really care whether the machine is a Mac, Windows or Linux machine. I have several theories why this device agnostism will grow. The first is that the cloud/online services/web apps, both for processing and storage, makes it possible to switch from one device to another, from one location to another and not lose any bit of data or processing power. By using Google Drive, Dropbox, iCloud, Blackberry Protect and my hard drive, a stolen or lost laptop or phone does not necessarily mean loss of data. Access to internet is closely related to the cloud. As access increases in reach and reliablility, cloud takes on a more apealing propsition and the browser takes on an increasingly more central role in the computing. I carry around a Safaricom modem with me allowing me to access the internet on a computer wherever I may be. Flattening tech: It’s becoming harder for technology companies to differentiate their products on technological improvements as these improvements tend to take on an asymptotic curve; as we move through time, the technological improvements become smaller and smaller- think of the differences between an iPhone 4 and 4S. In addition, it now takes a much shorter time for a something new to become an industry standard; if Apple release a Core i12 processor in August, all other computer makers will have the same tech in 2 or 3 months at most. Moreover, the tech advances are rapidly approaching the point at which they will cease to make sense for the majority of users. The average computer user will have no use for 64GB RAM. Our computer uses are increasing but are by far outstripped by the advances in hardware and software. In addition, platforms such as Google’s Android have lowered the barrier of entry, allowing all kind of companies to become players in consumer tech. That includes Caterpillar. Yes, the yellow tractor guys have an Android phone. Another reason is that functions that were limited to computers have been distributed across several devices. We now have internet access on our phones, iPads, Galaxy tabs, phablets, cars and very soon fridges and even the walls in our houses. I rarely, if ever read PDF documents on my laptop, preferring to read them on my iPad. I read all my ebooks on my Kindle and prefer to check Twitter on my phone, and Facebook on the iPad. If I want to watch something I plug my hard drive into the TV or transfer the movie onto the iPad and watch it there. The only time I actively use a laptop is when I am creating documents and blogposts, and working with spreadsheets. Are we likely to see a time when the only need we’ll have for a computer is to access the internet? Google seems to think so, explaining the development of the Chrome OS and Chromebook. Of course, when you go into the realms of engineering, design, video and sound editing, and other specific kinds of work, the operating system you choose plays a huge role on your work, but for the average computer user, we may just end up on the matrix 24-7. In short you mean to tell us .. “I own a MacBook Pro, IBM T60 laptop, an iPhone 4S, iPad 2, Galaxy Tab, Kindle Fire, Blackberry, a 60” Samsung TV and waiting to get a ChromeBook… you know… huh? You forgot a BMW that sings me lullabies, and a house on the dark side of the moon. Never mentioned that I own the devices. just that I use them.